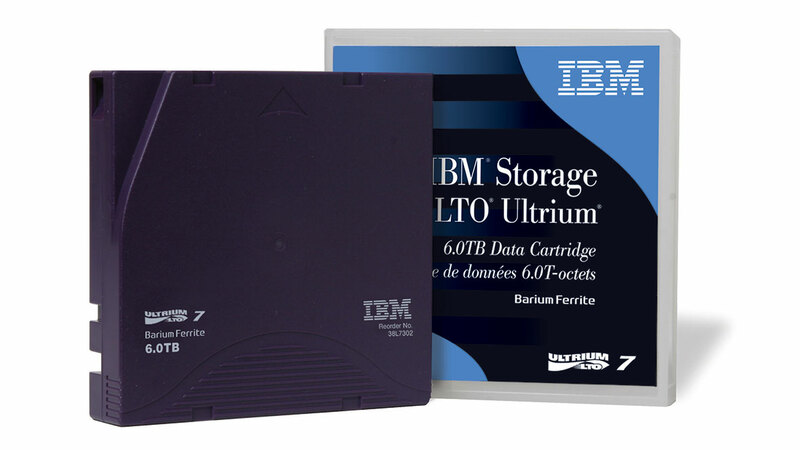 IBM LTO Ultrium 7 Data Cartridge offers more than double the storage capacity of previous generations for long-term data preservation that provides security as it sustains rapid, reliable access to data and helps ensure business resilience. Today’s rapid data growth compounds the need for increased storage capacity. The seventh generation of LTO Ultrium tape media delivers 6 TB native capacity and up to 15 TB of compressed capacity for significantly greater efficiency and performance. This exceptional capacity helps reduce the number of cartridges and the amount of equipment, space and labor associated with tape-based data storage. Leverage tape cartridge portability to facilitate remote, offline data storage for superior protection from natural or man-made threats that can impact online or on-site data storage. Leverage 6 TB native capacity and up to 15 TB of compressed capacity for significantly greater efficiency and performance, as well as reduced cartridge, equipment, space and labor requirements. Allow users and applications to directly retrieve files from tape rather than rely on third-party applications to enhance data access and potentially reduce software licensing costs and dependencies.